Preheat your oven to 400F (200C). Toast bread for about 10 minutes until it starts to brown. Check it to make sure it doesn't burn! Remove from oven and set aside. Toast bread for about 10 minutes until it starts to brown. Check it to make sure it doesn't burn! Remove from oven and set aside. Reduce oven temperature to 350F (180C). Lightly grease a casserole dish. In a large pot, heat the olive oil over medium high heat and sauté the onions, celery, and apples until they begin to caramelize. Add in the garlic, sage, thyme, salt and pepper and sauté 1-2 minutes more until fragrant, then remove from heat. Stir in the bread cubes and 2 cups broth. Add more broth as needed until bread is softened but not soggy. 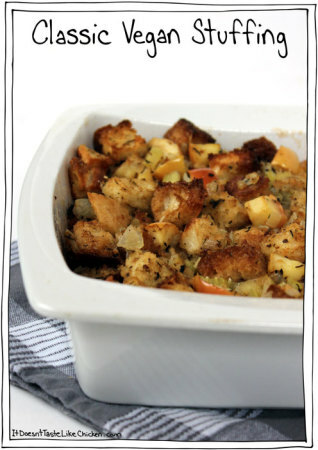 Spread the stuffing into the casserole dish, cover with foil and bake for 25 minutes. Remove foil and bake another 10-15 minutes until top is browned.